BMW workers equipped with Eksovests work on the underbelly of an SUV at the automaker's U.S. plant. SPARTANBURG, South Carolina, USA -- In the comic book world, Doctor Octopus manipulates four tentacle-like metallic arms to fight Spider-Man, and Iron Man Tony Stark dons a high-tech suit to gain super strength. 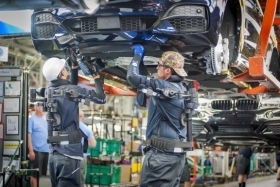 The vest is a wearable exoskeletal tool created by Ekso Bionics of Richmond, California. It uses no power, but provides ergonomic upper body and arm support that makes objects seemingly weightless and enables a worker to operate in a factory line posture without fatigue. "I used to think we really could use an Iron Man suit," Pochiro said. "And when I saw exoskeletons on a TED Talk, I got management approval to start a pilot program." Designing an ergonomically optimized assembly line can provide a competitive edge by enhancing worker productivity, especially as workforces get older. Pochiro said workers who tried the vest don't want to go back. "We've run trials on 30 employees and they really love it," Pochiro said, adding that he is evaluating prototypes from two U.S. companies. "Safety is improved, there is less fatigue, and job satisfaction goes up," he said. "So we see lots of potential."